Want to see the highly anticipated movie “Trading Paint” before it hits the movie theaters on March 22nd, today, Friday, February 22nd is your lucky day, an early release is available today on Ultra Video On Demand and on iTunes and Amazon. The movie will be in theaters and available On Demand on March 22nd. “Trading Paint” was filmed on location in Hueytown, Bessemer, Birmingham and other places in Alabama including Talladega Short Track in Eastaboga. It stars John Travolta, Toby Sebastian, Shania Twain, Michael Madsen, Rosabell Laurenti Sellers, and Kevin Dunn. It was directed by Karzan Kader, written by Craig R. Welch, Greg Gerani, and produced by Alberto Burgueño, Alexandra Klim, Andrea Ievolino, and Silvio Muraglia. A down and out stock car racing legend (John Travolta) is drawn back to the dirk track when his son (Toby Sebastian), an aspiring driver, joins a rival racing team, which sparks an intense and dangerous competition between father and son. After a failed race due to shoddy equipment causes a rift in a legacy racing duo led by Sam and his 20-year-old son Cam, alternate career options become more attractive to the young racer. As the father of a baby girl and husband to a beautiful wife, Cindy, Cam longs for a brighter future for his family as well as his career. Rival racing giant Bob Linsky (Michael Madsen) presents a path to this reality for Cam, forcing him to confront his place within his family’s racing history and the place of his own life. Sam is off the old school; he values strategy and sportsmanship in racing. He urges his son to race with integrity and berates him when he feels that hasn’t been done. Cam, on the other hand, wants to win. It’s all he thinks about, and he’s willing to do anything on the track to get him closer. This difference in values amplifies the generational gap between the two and leads to conflict when Cam reveals that he has agreed to race for Linsky. Family trauma is resurrected as Sam larks on the family’s lives before the death of Cam’s mother years prior. These memories begin to haunt Sam just as tensions between him and his son increase; after Cam and his brand new car beat Sam and his clunker in a casual race, he finds himself bereft of a racecar and on worse terms with his son. Sam leans on his girlfriend Becca (Shania Twain) in response. The tables begin to turn as Sam takes first place in the first races of the season. During the third race, an accident causes Cam’s car to collide with Sam’s, sending his son flipping down the racetrack. In the hospital, Sam learns that Cam will never walk again due to the crash. The two reconcile after Cam apologizes and Sam affirms his love and support for his son. As the final race approaches, Sam announces his retirement. Cam, too, is out of the races, but not for long as he begins to regain feeling in his toes. Soon he’s racing again, against his former boss Bob Linsky. Cam is triumphant in this final race, and thanks to his father heartily in his acceptance speech. Karzan Kader directed TRADING PAINT from a screenplay written by Craig Welch and Gary Gerani. AMBI Pictures and Paradox studios fully financed and produced the film. Production began in Alabama mid-August 2017. The dirt track races were filmed at the Talladega Short Track in Eastaboga, Alabama. "Of course if I want to create an effect on others, I will break out into a familiar song,” Travolta laughs. 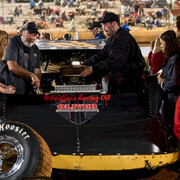 “For instance, these cars [on the dirt track] are all lined up, and there's a bunch of guys and girls around the cars, and I'm in front of them, and I thought, if I broke out into Greased Lightning right now, I bet it would cause a very good effect. So I did the whole thing... well the whole crew, everyone went crazy. It was the perfect set up."